Christmas stockings make great decorations in the run-up to Christmas. They’re also lovely keepsakes for young and old alike. 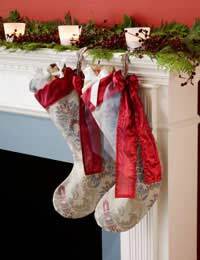 Although you can buy Christmas stockings easily, home-made ones are extra special. Making home-made Christmas stockings is also an enjoyable festive activity for the family. 2. Cut the paper stocking out. 3. Fold the felt and the lining in half. 4. Pin the paper pattern to the fabrics and cut out. You should be left with four boot-shaped pieces of fabric. You will also need a cuff strip of about 2.5 inches wide that is twice the length of your stocking opening, plus an inch for the seam allowance. 5. Place the main boot fabric pieces on top of each other, right sides together and pin. 6. Set your machine or hand needle up with matching thread and carefully sew the pieces together. Be sure to leave the top seam open so you can put presents in the stocking! 7. Repeat steps five and six with the lining fabric. 8. On your two inside-out boots, clip the fabric close to the seam, being careful on the curved edges. 9. Turn the stockings the right way out. 11. Fold the cuff piece in half, right sides together, to make a loop. Pin the short ends. 12. Stitch the cuff together at the short ends so that you have a loop of fabric. 13. Fold the cuff in half wrong sides together. 14. Pin the cuff to the stocking right sides and raw edges together. 15. Stitch the cuff carefully on and stitch, clipping the excess seam allowance off. 16. Make a small loop by folding a strip of fabric together, right sides together and sewing along the long edge. Tuck the ends under and stitch. Sew the loop onto the top of the back seam so it can hang.